Leon Reyfman, MD, RPh is a graduate of Ross University Medical School where he earned the prestigious Award of Academic Excellence. He completed his internship in Internal Medicine at Maimonides Medical Center. Following his internship, Dr. Reyfman completed a residency in Anesthesiology with focus on Pain Medicine at SUNY Downstate Medical Center in Brooklyn, NY. With pain management being his primary interest, Dr. Reyfman pursued and was granted a fellowship at the world-renowned Columbia University College of Physicians and Surgeons/St. Lukes Roosevelt Hospital. While at Columbia/St. Lukes Roosevelt, Dr. Reyfman honed his skills and gained extensive experience in patient interaction, continuity of care, physical rehabilitation, and the value of teamwork. Dr. Reyfman is board certified through the American Board of Anesthesiology in both Anesthesiology and Pain Management. Dr. Reyfman has extensive clinical experience and training in invasive and non-invasive pain management. 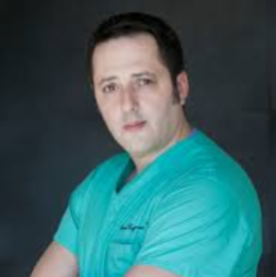 He currently serves as the Director of Interventional Pain Medicine at Long Island College Hospital and is Assistant Clinical Professor of Anesthesiology at SUNY Downstate Medical School. Dr. Reyfman is a member of American Society of Interventional Pain Physicians as well as the International Spine Intervention Society. Dr. Reyfman is actively involved in Pain Management research. Professional Membership American Medical Association (AMA), 2002-present. American Society of Anesthesiology (ASA), 2003-present. NY State Society of Anesthesiology (NYSSA), 2003-present. American Society of Regional Anesthesia and Pain Medicine (ASRA), 2005-present. American Society of Interventional Pain Physicians (ASIPP), 2007-present. International Spine Intervention Society (ISIS), 2007-present. North American Spine Society (NASS), 2011-present. The New York Pain Society, 2011-present. Founding member. American Society of Addiction Medicine, 2010-present. The Medical Society of the State of New York, 2004-present. International Society of Medical Laser Application, 2013-present. Pain Physicians NY 2279 Coney Island Ave, Ste 200, Brooklyn, NY 11223 +1 718-998-9890 https://www.painfreenyc.com Payment: cash, check, credit cards. Working Hours: Monday: 9:00 am - 6:00 pm Tuesday: 9:00 am - 6:00 pm Wednesday: 9:00 am - 6:00 pm Thursday: 9:00 am - 6:00 pm Friday: 9:00 am - 6:00 pm Saturday: 9:00 am - 6:00 pm Sunday:CLOSED.